This book right here, every time I look at the cover I get instant goose bumps. This story is a bit different than what I usually go for, but the story line just seemed so freakishly disturbing that I knew I have to get it. 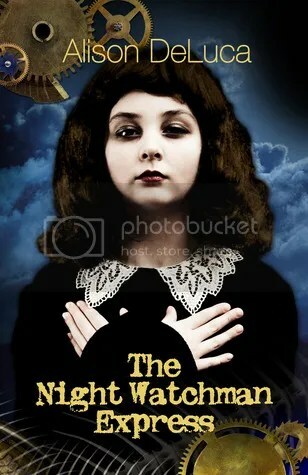 Miriam, an orphan who is toughing it out in the world, whose only real fears lie with Night Watchman Express, a train who takes people at random and drags them to this mysteriously evil location. There, people say experimentations occur at the old factory and once you get in…you are most likely never heard from again. Now imagine that, you have no one but yourself, stuck in what I am imagining is a pretty big house and hearing that terrifying train run by your house every night. Oh and did I mention you’re alone? That is some messed up business. I would be so worried about falling asleep and knowing maybe they might catch me. Say hello to too much coffee and a life dedicated to being an insomniac. Of course, that’s not all with the story, poor Miriam just got herself some new family-mates, the Marchpanes, who are harbouring a secret or two and are rumoured to be linked to the NEW. We mustn’t forget their lovely (or maybe not) son Simon who is far from being Miriam’s best person in the world. But you know what they, if you can’t love friends love your enemies…I hope that’s the saying anyway. Also, as you can guess that nobody escapes The NWE as poor Miriam and Simon become its new passengers and what awaits them is danger, evil, and jailers who are more than just a pretty face. The part of the jailers I must admit, I got an image of a scene in that movie Silent hill where Radha Mitchell’s character is stuck in a dark basement with zombie nurses…creepy. If you haven’t seen the movie, no worries, my head just likes making associations. This entry was posted in 2012, Book Wish List and tagged Alison DeLuca, Book Blog, Book Wish List, Fantasy, literature, Meli, The Night Watchman Express by dreamingwithink. Bookmark the permalink.